Gabriel Medina’s victory at the Fiji Pro last June was a cause for double celebration here at Cabianca Surfboards – Gabriel’s Fiji quiver were the first boards shaped by Johnny at our brand-new BCSC factory here in the heart of the Basque Country, in Zarautz, Spain. As far as fantasy surf destinations go, the long and powerful lefts of Fiji’s Cloudbreak are pretty much up there on every goofy footer’s bucket list, so if you’re wondering what board a champ takes to paradise, here’s the lowdown on what Gabriel surfed in Fiji, and why. Cloudbreak: this is a powerful wave with legendary barrels, so we try to keep the board a little bit narrower, compared with doing the same model for beach breaks. But, the wave isn’t just about barrels: sometimes it also gives room for maneuvers on the face, and long sections where you need to pump hard to generate speed. Therefore the boards need to have a little extra weight, and lots of flex for stability and speed generation – to achieve this we only use 4oz glassing on the deck for flex, with a little extra resin in the hot coat for weight. When it comes down to it, Cloudbreak isn’t any more challenging than shaping for other waves. 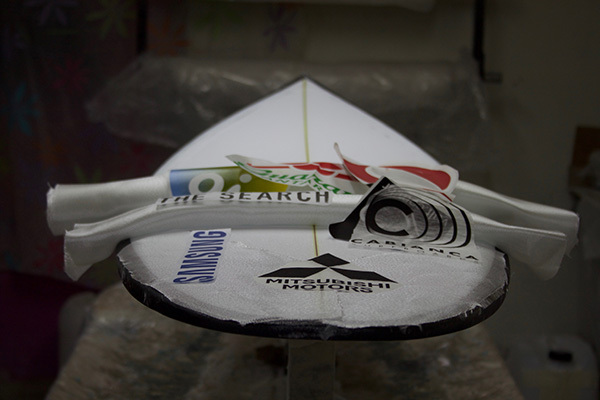 Once you have a solid foundation to work with – in this case the DFK, a performance board that excels in quality conditions – it’s then just a case of fine-tuning the design to match the wave’s characteristics. * For average conditions and contests on softer beach break waves like Rio or Snappers, Gabriel uses ‘The Medina’.